As it is equipped with 20/24 curved waves, it works as though it were a disc with twice as many notches as the discs normally available on the market. Both the shape of the curved-wave disc and the aggressive blade last more than a disc with traditional notches. These blades are for Vertical Tillage and are recommended for soft soils as it cuts waste perfectly and it penetrates deeply into the ground. Furthermore, as the blade gradually wears down, it becomes more aggressive, thus guaranteeing a longer working life for the disc. 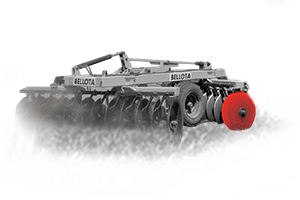 These blades are for Vertical Tillage and are recommended for soft soils as it cuts waste perfectly and it penetrates deeply into the ground. Furthermore, as the blade gradually wears down, it becomes more aggressive, thus guaranteeing a longer working life for the disc.